IGE Chairman SaKong Il (right) introduces to audience WTO Director General Roberto Azevêdo at IGE breakfast forum held at Hotel Shilla in Seoul on April 16, 2014. Chairman SaKong Il of the Institute of Global Economics (IGE) invited Roberto Azevêdo, director-general of the World Trade Organization (WTO) for his breakfast forum held at Yeongbingwan of Hotel Shilla in Seoul on May 16 (Friday), 2014. During his lecture the WTO chief emphasized the importance of Korea's role in the world trade governing body by praising Korea for her rapid economic success due mainly to her export-oriented economic policy of the past. The press conference, held immediately after the forum, was attended by scores of local journalists from various news media. 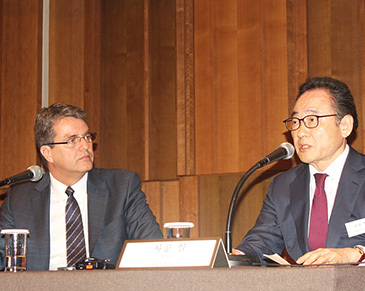 Azevêdo, who arrived in Seoul on May 15, 2014, visited the Seoul National University for a special lecture on its campus. On the day he also met with National Assembly Speaker Kang Chang-Hee, with Minister Lee Dong-Phil of the Ministry of Agriculture, Food, and Rural Affairs, and with Minister Yoon Sang-Jick of the Ministry of Trade, Industry, and Energy (MOTIE). After the IGE press conference he met with Foreign Minister Yun Byung-Se. It was his first visit to South Korea. Mr. Azevêdo has been serving as WTO director general since he took up the post on Sept. 1, 2013. The special lecture was hosted jointly by the IGE and the KITA (Korea International Trade Association). The forum started at 8 a.m. for a two-hour run and was attended by policymakers, businesspeople, academics, researchers, other foreign dignitaries, as well as scores of local journalists. The press conference began at 9:50 a.m. for a 40-minute run. The diplomat-turned world’s top trade official majored in electrical engineering at the University of Brasilia. He also studied international relations at the “Instituto Rio Branco,” the graduate school of international relations and diplomacy run by Brazilian Foreign Ministry. He became a diplomat by joining the Brazilian Foreign Ministry in 1984. As a diplomat his first assignment was to serve in Washington DC in 1988. Then he served in the Brazilian Embassy in Montevideo. He was assigned to the Permanent Mission of Brazil in Geneva in 1997. In 2008 he was appointed Permanent Representative of Brazil to the WTO and other International Economic Organizations in Geneva. Mr. Azevêdo has been a frequent lecturer on topics related to international economics and has published numerous articles on these issues. He is married to Ambassador Maria Azevêdo and has two daughters, Paula and Luisa, and two granddaughters, Alice and Olivia. Who Is Dr. SaKong Il? Dr. SaKong Il currently serves as chairman and CEO of the Institute for Global Economics in Seoul, South Korea founded by himself in 1993. He was formerly Minister of Finance (1987–88) and Senior Secretary to the President for Economic Affairs (1983–87) of the Republic of Korea. He also served as chairman and chief executive officer of Korea International Trade Association (KITA). He has been serving as chairman of the Presidential Committee for the Seoul Summit since 2009. The world-famous scholar has been invited to numerous institutes. He was the visiting fellow (1991–92) at Peter G. Peterson Institute for International Economics. He has authored many books and written countless articles regarding issues on Korean economy, economic development, international finance, and trade policy. They include “Korea in the World Economy (1993).” He also coedited several conference volumes with C. Fred Bergsten, including The Korea–United States Economic Relationship (1997), Korea–United States Cooperation in the New World Order (1996), and The Political Economy of Korea–United States Cooperation (1995). SaKong is the recipient of a number of prestigious awards for his contribution to the world’s economy. They include Blue Stripes Order of Civil Service Merit, Korean government (1990); Order of the Brilliant Star with Grand Cordon, China (1987); Order of the Crown, Belgium (1986); and Grand Prize for Distinguished Policy Makers, Korea University (2002). He graduated from Seoul National University in 1964. He went on to his graduate study at UCLA, earning his MBA in 1966 and Ph.D. in 1969.